Dark Prophet by, K.N. Lee is on sale for 99 cents from 8/7/2014 to 8/15/2014! As a celebration, she is throwing a huge party and giveaway. When I finished reading K.N. 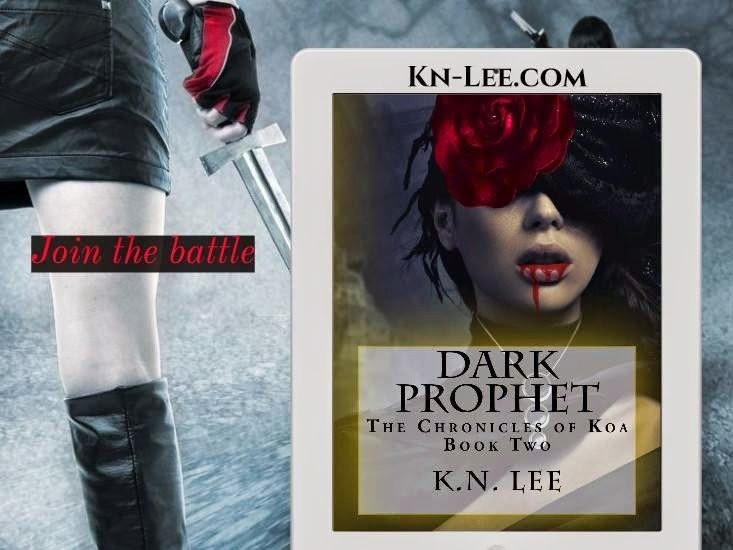 Lee's "The Chronicles of Koa: Netherworld," I remember the anticipation which began to build from that moment for the story I knew was coming. There's already a legion of fans out there who share my opinion. Join us, and get this book, folks. I can't even begin to express how much I loved this book! I started it this morning and did not put it down until I'd devoured every single page. It was just so brilliantly written and paced perfectly that I was just so enthralled in the story that I just had to know what happened. Halston was a favourite of mine in the first book, and yet again K.N. Lee just had me swooning at his every word, action and look. *sigh* I am so in love with him. I felt my heart leaping in my chest when Koa's past was revealed, a past that includes a long lost love that has been returned to her, and I really hoped that Koa wouldn't forget the new life she had made for herself and the connection that she shared with Halston, now that memories of her past had been returned to her. The action and drama in this book was paced perfectly, and I was on the edge of my seat throughout, biting my lip and glaring at anyone who dared interrupt me when I was reading. I loved seeing how the allegiances changed throughout this story, and those who we thought we could trust turned to other sides, and what we thought was the truth is far from it. This really brought the suspense to a whole new level and I felt giddy with nerves and excitement as everything that Koa was fighting for began to change. A brilliant continuation of the Chronicles of Koa series, and I CAN'T WAIT to see what happens next. I am addicted!! Enter the book giveaway and you can win a signed copy of Netherworld. Sounds like an awesome book and you can't beat that price of $0.99! Sounds like a great book! Your book report is wonderful and enticing. I entered your giveaway! This sounds like a great book! My sister would love this book. She's really into vampire fiction.